In the run-up to the Russian presidential election, the homophobic video has been shared to help boost voter turnout. News 20 February, 2018 . Written by Katie Donohoe. 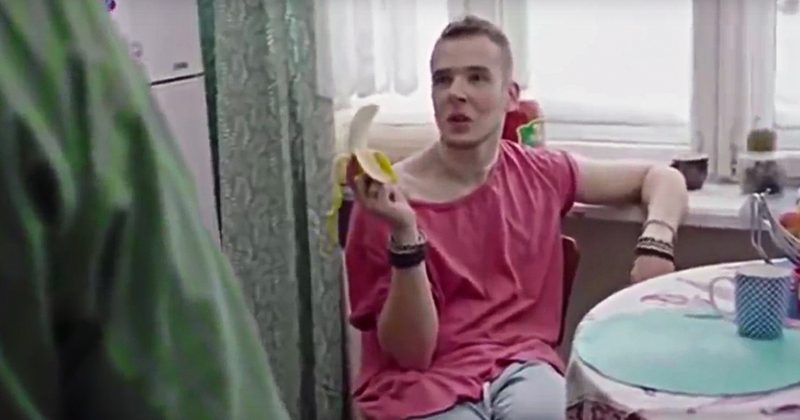 A Russian advertisement has gone viral in which a man is experiencing a nightmare where a gay man lives in his home and he is drafted into the military all because he didn’t vote in the presidential election. The homophobic and xenophobic viral video has been watched by millions social media since Friday and stars professional actors who say they do not know who ordered the video. Opposition journalist believes that the video was produced by the election committee or by Vladimir Putin’s campaign team. This is in response to the opposition figurehead, Alexei Navalny, urging voters to boycott the election claiming that it is rigged. It is set on the morning of the election, March 17, and in the first scene, his wife set the alarm clock so she can make sure she gets up to vote on time. “As if they won’t elect someone without you,” he says. He then enters the kitchen to find a man with tattoos sitting at the kitchen table. “Who’s this?” the man asks his wife. “I’m a gay on a homestay,” the gay man replies. “The law is the law,” he says as he bites seductively into a banana. A spokesperson for Russia’s election committee said it has nothing to do with the video. Putin’s campaign team have yet to comment. 20 February, 2018 . Written by Katie Donohoe.